RS Technologies + 91 9899391434 We “R.S. Technologies”, Established in the year 2004, at Faridabad (Haryana, India) are well-known Manufacturer and Supplier of outstanding range of RO Plant, ETP Plant, APCM Plant, DM Plant, Water Softener, STP Plant, Fire Fighting Equipment, Control Panel, etc. We are Sole Proprietorship Firm, moving toward success by offering superior quality products. The offered products are assembled and manufactured by our practised experts utilizing the best quality components with the aid of progressive technology in adherence to industry laid norms. These products are widely admired by our patrons for their features like durability, reliability and sturdy construction. We offer these products in various specifications as per the exact necessities of the clients. Besides, we render Maintenance of RO and AMC And Fabrication Service for our clients in a hassle free manner. We have developed a sophisticated infrastructure facility that helps us to manufacture an elegant array of products in bulk quantity and in assured time frame. It is spread across a wide area of land and includes many sub-units like procurement, designing, quality control, warehousing & packaging, etc. 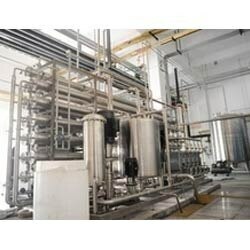 To make sure of hassle-free production process, these units are armed with modern machinery and up-to-date technology. Our experts work in close coordination with each another to satisfy the variegated needs of our respected clients in the most efficient manner. Being a quality oriented organization, we make enormous effort to provide our clients with outstanding quality products as per their requirements and attain their satisfaction. Motivated by aspiration of our Mentor, “Mr. Shiv Ram Sharma”, we have reached on top position in this highly competitive market. His rich industry experience and enthusiasm help us to accomplish specific necessities of our patrons in the best manner. Our distribution network, is spread all over the nation, which is one of the prime reason of our success. We are the Manufacturer of RO System for Pharma Industries .We are Proving the services in all over the india and We have more existing pharma industries attach with us .